Now that recreational marijuana is legal in Canada and 10 US states (with potentially more on the way), businesses are finding increasingly innovative ways to encourage consumers to part with their cash in their search for a lawful high. Think of an edible product and there is probably some company somewhere flagging a cannabis-infused version of it. Cannabis-infused cereal, gummies, chewing gum, ice cream, hazelnut chocolate spread, and key lime pie are all available for your consumption. While customers with more of a savory tooth can tuck into a cannabis-infused pizza or a piece of cannabis-infused beef jerky. Even country music singer Willie Nelson, of "On the Road Again" fame, has jumped on the bandwagon aged 85, releasing a line of hemp-infused coffee. But perhaps one of the most exciting innovations is the development of drinkable marijuana, which is technically much harder to pull off than it might first seem. It is now possible to get your hands on marijuana beer (at least, if you are in California). Two Roots Brewing recently announced the launch of "the world's first cannabis-infused, non-alcoholic, craft cannabier" this week, a drink that promises to get you high within 10 minutes of slurping. The effects of the products, some THC-infused and some CBD-infused, are said to last roughly 90 minutes. It's not surprising that the beer industry is turning to marijuana. 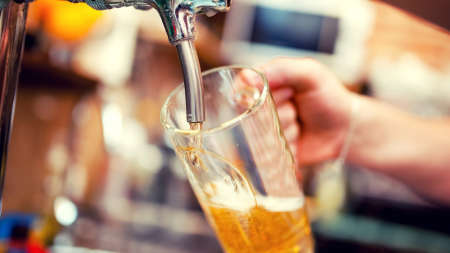 Recently, a study reported a 15 percent dip in alcohol sales in states with medical marijuana laws, while researchers at the Canaccord Genuity Group Inc expect the business of cannabis-infused beverages to be worth $600 million by 2022 in the US alone, Bloomberg reports. Constellation Brands Inc, proprietors of Corona and Modelo have invested a 38 percent stake in Canopy Growth Corp, formerly Tweed Marijuana Inc. Meanwhile, AB InBev, the distributor of Becks and Bud among others, are working in partnership with Tilray Inc, a Canadian-based cannabis and pharmaceutical company. The problem that each of these companies has faced is that, unlike alcohol, marijuana cannot be dissolved in water. This means that the drug takes longer to metabolize and the effects take longer to begin. Two Roots Brewing got past this process by dabbling in the art of nano-emulsification, a drug-delivery system that enhances drug solubility. This way, the cannabis molecules in the drink are more evenly scattered and so are more easily absorbed by the body. It is the secret behind the 10-minute onset time, the company says. Meanwhile, other companies are coming up with their own solutions. Toronto-based Province Brands, for example, brew their beer with hops, water, and yeast – plus the stems, stalks, and the root of the cannabis plant. While Trait Biosciences is using a process called glycosylation. We guess it won't be long before cannabis-infused beer becomes a regular feature at a happy hour near you.